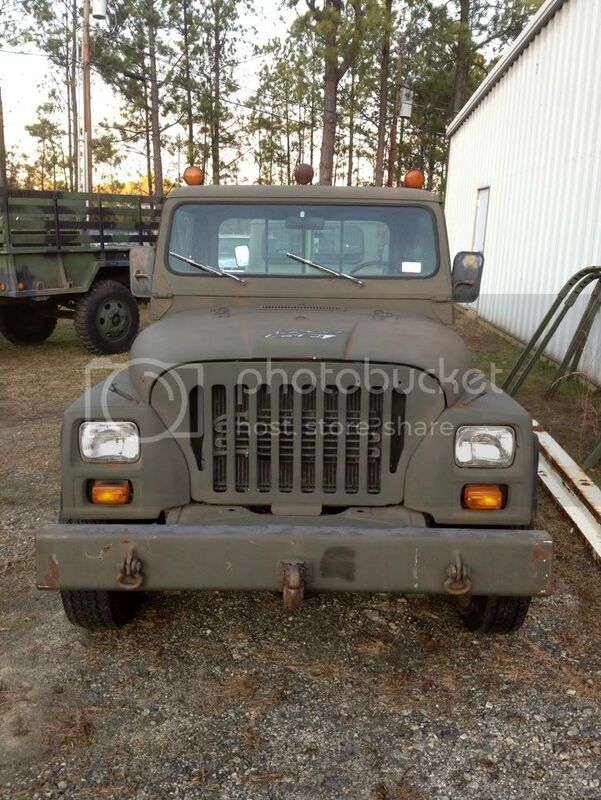 I am looking at buying this Jeep I know exactly what it is the question is do you? CJ-10 Aircraft tug- Nisson diesel most are 2 wheel drive with a tranfer case locked in low range. Np 205 transfer,dana 70 rear,4.88 gears.Kinda heavy. Dang you Richard I wanted to get atleast a few guesses in. But that is cool because you where the first to guess my next possible project. I have been in need of a tow vehicle that will pull anything for awhile and I would say this qualifies. Or I could easily convert it over to 4x4 with a Dana 60 since the drive flange is still attached to the transfer case. The front axle is a tube is it not? Mounting a drive axle would be relatively easy if so. Don't know about going highway speeds,if you can live with 50-55mph that will be the coolest thing on the road though. Tubed with shocks and and some of the largest leaf springs i have seen even a full sized truck. And i am thinking D60 or maybe a well build and trussed D44. But more then likely a D60 out of and F-350 unless someone has other suggestions. I mean this truck is already heavy anyway and i will loose some wieght as i go. Most have a large steel plate in the bed for added traction, pulling planes and such, remove it for better all round use. Think a 60 would be preferred choice,could remove a few leafs to lighten suspension? up a little. Large steel plate the whole thing is large steel plate the "bed" is the tool box and gas tank the rear and front bumpers are atleast 1 inch thick. I mean the thing is built like it should be taking grenades not pulling aircraft.